The Kintsugi Garden not only preserves and shares Japanese and Japanese American culture and heritage it also accentuates beauty in three ways: first, it is a beautiful park-like setting that serves as a central gathering place and a peaceful refuge from the hustle and bustle of city life; second, it is a wonderful venue for people to express their own creative talents through performances at our many cultural events throughout the year; and finally, the garden and its central plaza highlight the art form of pottery mending called Kintsugi. Kintsugi is the process of using gold to mend the pottery makes the original piece of art even stronger and more beautiful than before. Our community is represented by the brass inlay running through the plaza. This entire plaza space symbolizes how the Japanese and Japanese American community were once torn by World War II, but have now healed and grown even stronger through the generations. Personalized garden tiles are available for a suggested donation of $300. Tiles will be installed on the garden’s east wall. The tiles are a way to leave a lasting legacy and to honor family members or loved ones, past or present. Glassworks Architectural Art Glass created these custom fused glass tiles that are etched and painted with names or inscriptions. Kintsugi is a Japanese technique of salvaging broken pottery by mending the pieces back together with gold. 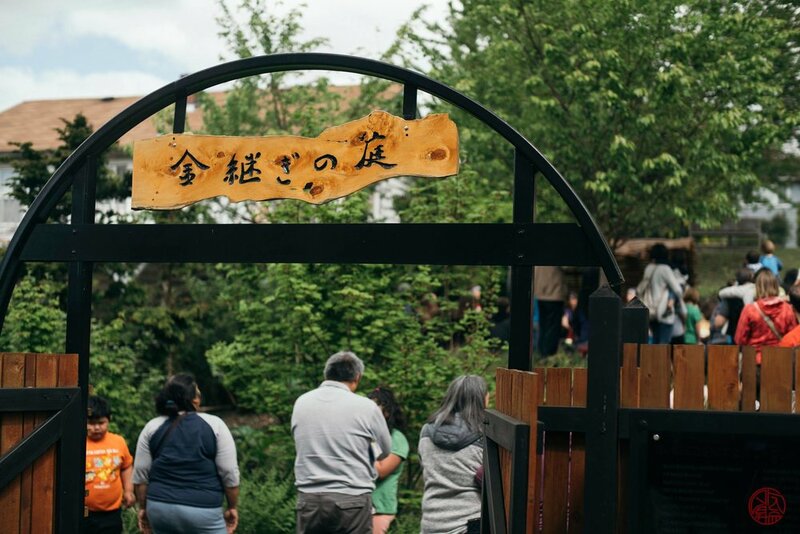 The line of brass laid within the pavement of the garden acts as a reminder of the perseverance of the Issei and Nisei pioneers and their ability to adapt to life in America. To dedicate a garden tile, please print this form and return it to our office.